Snoring may seem like an annoying inconvenience, but often it’s more than that. Snoring can be a sign of sleep apnea, a condition that causes your breathing to stop intermittently while you sleep. As a result, you can experience severe fatigue and a host of serious medical issues. The condition is common, with an estimated 18 million suffering from it. Millions of children are also afflicted but their apnea often goes undiagnosed. Obstructive sleep apnea (OSA) and central sleep apnea. Obstructive apnea is caused by a blocked airway during sleep. Often this is caused when tissue in the back of the throat collapses and stops you from breathing properly. Central sleep apnea stems from the brain’s failure to tell the muscles to breathe, causing your breathing to start and stop while you are asleep. You may have sleep apnea if you snore loudly, wake up with a dry mouth and/or sore throat, have a morning headache, experience insomnia and are extremely sleepy during the day. You may also abruptly awake and then be short of breath. Others may notice that you stop breathing for short periods during the night. Anyone can develop sleep apnea, including young children. You are at a greater risk of developing this condition if you are overweight, male, over 40, and have large tonsils or sinus problems. Simply having a large neck increases your risk as does having gastroesophageal reflux. Sleep apnea can lead to stroke, heart attack, diabetes, depression and high blood pressure. Sleep apnea can cause life-threatening conditions, so you need to seek treatment if you suspect that you have the condition. Sleep apnea can be treated in a number of ways. Oral appliances work for many and are much less intrusive than other remedies. 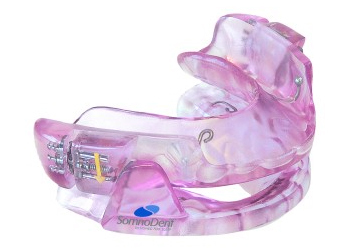 Your dentist can fit you with a customized appliance to wear while you sleep. They move your lower jaw forward in order to keep your airway open and keep the soft tissue from collapsing and obstructing your breathing. These appliances are comfortable, portable, and easy to maintain. Some patients may need a positive airway pressure device such as a CPAP machine that provides pressurized air through a mask during the night. If you suspect that you have sleep apnea, make an appointment with your dentist as soon as possible.